APEX EXPO, Boston MA | September 24, 2018– The digital services platform Immfly, that, until now, could only be accessed onboard, can now entertain the passengers on the ground, while waiting for the flight. Based on the passengers’ access ratio and satisfaction level with Immfly’s platform, the company decided to extend, and specially, anticipate its offer to the airport. Airport vip lounges, or pre-boarding areas at the terminals can now have Immfly’s digital services at their disposal. The day of the flight means not only the flight but also beforehand in the airport, where only very few airlines can have a digital relationship with its customers. From the moment someone looks for travel inspiration to the time it gets back home, there are several touch-points that constitute a commercial opportunity for airlines and its partners to interact with customers and get the most of those interaction in the form of revenue or in the form of customer satisfaction. Many airlines have done a great job using their digital channels and capabilities to communicate in a more personal and personalised way with their customers at most of those touch points, but still, there are significant gaps in that digital customer journey. There are still touch points that are not being used in a digital way. The biggest digital gap is the day of the flight, “the moment of truth” for NPS, the phase that most affects customer perception of the whole experience. Immfly offers now the opportunity to not only entertain passengers during that typically hectic time, improving their experience through personalization and choice, but also a new opportunity to monetize that digital relationship. It is the chance to improve customer experience at the airport through entertainment and service at the same time that opens a new opportunity for ancillary revenues such as seatupgrades or activities at destination. Eventually, everything that could be done and enjoyed during the flight, can now be done before, on the ground. APEX, SITA, IFPL, Thales and More! APEX is coming, September 23 through 27, in Boston, Massachusetts. We will have more on the upcoming event in the next few weeks. You should know that Boston is the largest city in that state and home to some 660,000 folks. It was founded in 1630 and is home of Boston Commons, Freedom Trail, and of course, Harvard. Let’s get started with a new augmented reality app developed by SITA and Virgin Atlantic. Over the past decade, SITA and Virgin Atlantic have often worked together to drive innovation in technology. In 2013, the two companies partnered to develop award-winning Google Glass and Sony Smartwatch technology enabling Virgin Atlantic concierge staff in the airline’s Upper Class Wing to deliver the industry’s most high tech and personalized customer service. SITA is the communications and IT solution provider that transforms air travel through technology for airlines, at airports and on aircraft. The company’s portfolio covers everything from managed global communications and infrastructure services, to eAircraft, passenger management, baggage, self-service, airport and border management solutions. Owned 100% by more than 400 air transport industry members, SITA has a unique understanding of its needs and places a strong emphasis on technology innovation. We should also note that Virgin Atlantic was founded by entrepreneur Sir Richard Branson 34 years ago with innovation and customer service at its core. Today Virgin Atlantic carries 5.5 million customers annually. 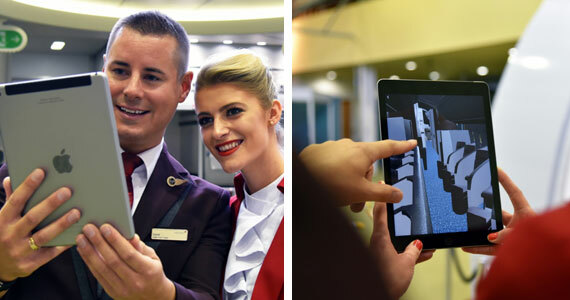 Virgin Atlantic is introducing innovative training technology – as part of an innovation collaboration with SITA, the leading global IT provider – that allows the airline’s cabin crew to use augmented reality to familiarize themselves with new aircraft. Using an iOS app, cabin crew use augmented reality to walk through and acquaint themselves with the layout of Virgin Atlantic’s Boeing 787 Dreamliner aircraft without even visiting the airport or getting onto the plane. To complement the existing classroom-based training, this app allows crew members to see the cabin projected as a portal in front of them and are able ‘walk into’ the cabin. The AR app simulates the full-size view of the interior cabin, giving crew a feel for their new working environment, including accurate spatial awareness. This allows the airline to train crew on new aircraft in a fun and engaging way from the airline’s headquarters in Crawley, London.Augmented reality presents several interesting use cases in the air transport industry, ranging from sales, training, operations and improvement to the passenger experience. SITA Lab, SITA’s strategic technology research arm, and Virgin Atlantic have teamed up to identify and test some of the more promising use cases, starting with the crew training app. Over the past decade, SITA and Virgin Atlantic have often worked together to drive innovation in technology. In 2013, the two companies partnered to develop award-winning Google Glass and Sony Smartwatch technology enabling Virgin Atlantic concierge staff in the airline’s Upper Class Wing to deliver the industry’s most high tech and personalized customer service. Thales has appointed Jean-Paul Ebanga, as Vice-President of Flight Avionics activities. Flight Avionics provides secured, natively connected systems and services that are in operation on two out of every three aircraft flying around the world every day. 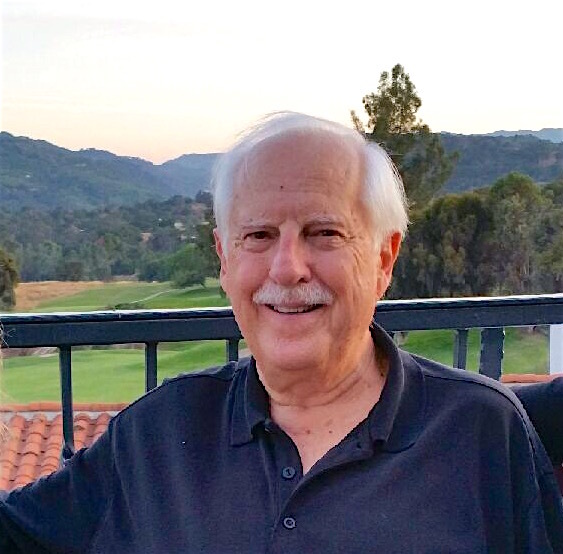 He reports to Gil Michielin, Executive Vice-President for Avionics. Mr. Ebanga is graduated from the ENSEM Engineering School. Inflight Entertainment and Connectivity (IFEC) specialists IFPL will be demonstrating how easy it will be for airlines to make the transition from USB-A to USB-C at APEX 2018 in Boston, USA. IFPL’s latest USB development enables airlines to easily transition from USB Type A to Type C using their existing USB-A onboard power architecture or supporting the newer USB-Power Delivery architectures that can provide up to 60W of power whilst designing their outlets to enable seamless seat integration. IFPL will be demonstrating the Patent Pending USB Charge To Charge technology offers a clever way for airlines to charge their passengers to turn on the USB power and also launch adverts and promotions when the passenger plugs in their device.As always, IFPL’s established range of IFEC products and solutions will be on display. An expert team will be on hand to discuss your requirements on booth #707 at APEX 2018. Aircraft Interiors Expo, Boston (AIX) the fall’s only meeting place for the passenger experience industry, has today announced the agenda for the stateside CabinSpace LIVE Seminar Theatre. 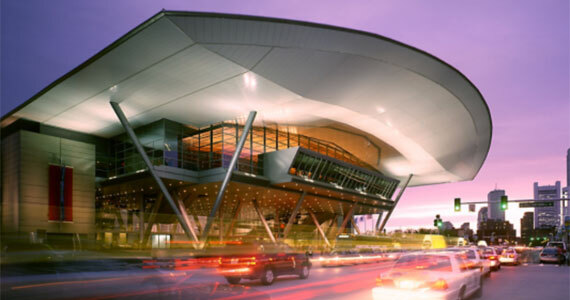 Taking place at the Boston Convention and Exhibition Centre, the action-packed agenda will see visitors treated to expert insight on implementing innovation in the cabin interior. Delving into best practice design, this session looks at the product journey from the drawing board, through to development and finally placement on the aircraft. Looking at the place of compliance and regulation in the process, the audience will hear from experts about how to overcome challenges associated with regulation in the most time and cost-effective ways. To bring the topic to life and in order to learn from the experience of others, Senior Program Managers from AAR will share their experiences designing for regulation. Keeping costs low whilst exploring new technologies has long been an issue for the aviation industry. This session will explore how manufacturing capabilities such as 3D printing are enabling innovative aircraft interiors products and parts without, increasing costs. From differentiating your business in a crowded market, to after-life use of printed parts, this session explores how to maximize the benefits of investing in 3D printing. Bringing together a panel of industry-leading experts, this keynote discussion on spatial dynamics looks at how to maximize cabin space and make it work for passengers, operational staff and crew alike. From balancing overhead bin space with headroom and ensuring innovative technology meets passengers’ ergonomic needs, spokespeople from airlines, OEMs and seating companies discuss space and its use inflight. To view the full agenda for CabinSpace LIVE, please click here. For the third time in a week, Airbus Perlan Mission II has set a new world altitude record for a glider, this time soaring the engineless Perlan 2 to 76,124 feet, in the process collecting vital data on flight performance, weather and the atmosphere. Yesterday’s flight by pilots Jim Payne and Tim Gardner surpasses even the maximum recorded altitude in level flight of the U.S. Air Force’s famous U-2 Dragon Lady reconnaissance aircraft: 73,737 feet, flown by pilot Jerry Hoyt on Apr. 17, 1989. The U-2 is powered by an engine that generates 17,000 lbs. of thrust. By contrast, the Perlan 2 is engineless, weighs just 1,500 pounds, and soars to its record altitudes on rare stratospheric air currents formed by mountain winds combining with the Polar Vortex. The overall altitude record for level flight of a manned airplane is held by the SR-71 Blackbird at 85,069 feet. The pressurized Perlan 2 glider is designed to fly to 90,000 feet, conditions permitting.Airbus Perlan Mission II will continue its 2018 flying season through mid-September, when the season for stratospheric mountain waves in the southern hemisphere begins to die down, and the all-volunteer Perlan Project team will return from Patagonia to homes in the U.S. and around the world. The number of flights remaining will be determined by weather conditions. 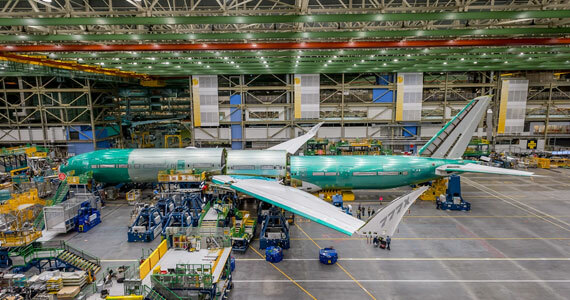 The airline, which has a number of 737 MAX 8s on order, said it saw the value of adding the MAX 10 to the mix as the aircraft will provide additional capacity and flexibility. With its headquarters in Brisbane, Australia, the Virgin Australia Group is the country’s second-largest airline with a fleet of more than 130 aircraft. The Next-Generation 737 has formed the backbone of the Group’s fleet with more than 80 currently in operation and the 737 MAX is expected to bolster the Group’s fleet. The MAX 10 is the largest member of the 737 MAX aircraft family. The airplane will offer operators the lowest cost per seat mile of any commercial aircraft and fly 200 nautical miles (370.4 km) farther than today’s Next-Generation 737s. This extended range means that the 737 MAX 10 will be able to cover 99 percent of single-aisle routes around the world. And speaking of booze, airlines that want to use iPhones to snag credit card data for collecting payment, now can! Square’s reader, now compatible with Apple’s Lightning jack! August 2018– Virgin Atlantic and Virgin Group have announced the intention to build a brand new Virgin-wide loyalty programme, with unique and differentiated reward opportunities to reward customer loyalty across Virgin companies. A new company, Virgin Group Loyalty Company, will be set up to own and manage this exciting programme. Virgin Red, an existing loyalty start-up within the Virgin Group, will also be integrated into the new group-wide loyalty programme. The new company will bring reward across the Virgin family together into a single company and create a more valuable offer for our customers. The new company will launch in 2019 and will be owned by Virgin Group and Delta Air Lines. Flying Club will continue as the frequent flyer programme for Virgin Atlantic’s customers and will continue to use miles as its currency. Flying Club members will continue to collect tier points and collect and redeem miles across Virgin Atlantic, Delta and a range of airline and other partners as they do today. In the future Flying Club members can look forward to an expanded range of ways to collect and redeems miles that will be powered by the new Virgin loyalty programme. The Virgin Group Loyalty Company and Virgin Atlantic will keep customers updated with more detail of the new loyalty programme as it is developed. Raunheim | August 1, 2018– Lufthansa Systems today announced that it has acquired Fan Air Ltd. as a new customer. The Ukrainian startup airline will use Lido/mPilot from Lufthansa Systems for the next five years. This navigation solution was implemented for the airline in the space of just two weeks after the contract was signed. Ukraine International welcomed its third wide-body long-haul Boeing 777-200ER aircraft into its fleet. The plane received the UR-GOC registration number. Ukraine | June 5, 2018– UIA will operate the aircraft on regular routes between Kiev and New York, Beijing, and Bangkok. UR-GOC aircraft accommodates 361 passengers in three-class cabin configuration, i.e. Business Class, Premium Economy Class, and Economy Class. Like the previous two aircraft, this plane is also leased from the world’s leading lessor AerCap. The first scheduled flight is planned on June 06. The aircraft is equipped with Panasonic Corporation AVOD (Audio Video On Demand) individual IFE system for each passenger. A vast content menu with over 80 feature movies, TV shows, children’s films and cartoons and works of Ukraine’s cinematograph are available on personal screens, which are built-in into each seat. USB-units and electrical power sockets will help to maintain the level of charge of electronic devices throughout the flight. A variety of entertainment modules and useful digital services will be soon enjoyable by every passenger onboard Air Nostrum planes. Multiple contents will be at passenger’s fingertips, easily accessed through their own smart devices (phones, tablets and PCs). Barcelona, Spain | February 28, 2018– Air Nostrum full fleet will soon count on Immfly’s digital services. The first CRJ aircraft equipped with Immfly’s service will take off this April. The airline based in Valencia is the first Spanish airline to install a plugged portable solution, ideal for its aircraft’s size and flight duration. Immfly identified the need for short-haul and low-budget airlines on having an economical and functional embedded onboard digital services. According to Air Nostrum aircraft’s dimensions, the portable plugged technology is a powerful solution and ideal to its airline profile. Avoids time-consuming installation ́s processes, that usually comes with fixed solutions due to the exigency of having the major Supplemental Type of Certification (STC), allows operating savings of not having to charge and swap batteries every day and involves fewer costs of installation. 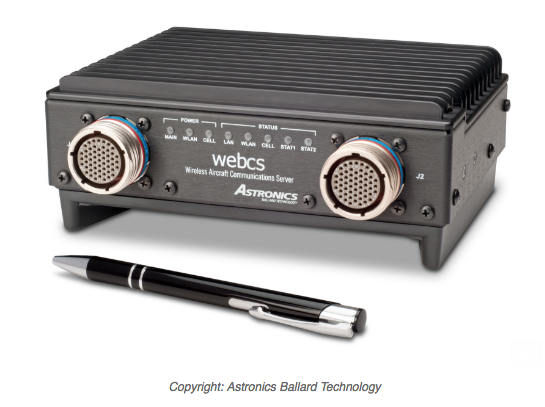 For all of these, Air Nostrum decided to adopt the embedded portable solution SkyCube. With the plugged portable solution, Immfly together with Air Nostrum present “Air Nostrum Play”, the onboard digital services platform that will be available as a freemium model to its passengers. Through a set of access points installed inside the planes, passengers will be able to connect to “Air Nostrum Play” and enjoy multiple entertainment modules among other airline services. “We are very proud to announce this partnership with Immfly, which will allow our passengers to enjoy media contents during their flights, therefore enhancing their onboard experience. We feel especially satisfied for having developed, together with Immfly and Sirium, an innovative technological solution, hat endows our regional full fleet with the ideal technology to bring a variety of media content onboard our aircraft”, mentioned Juan Corral, the Commercial Director of Air Nostrum. Istanbul | January 19, 2018–The contract comprises component repair and access on ATA (The Air Transportation Association) Chapter basis. Access to components will be available from Turkish Technic Istanbul main base and worldwide pooling stations. Repair work of the components will be carried out at the Turkish Technic Sabiha Gokcen facilities, the biggest MRO facility in the region. The contract has enhanced the existing strong business partnership between the parties, and will be contributing to the development of the Turkish global aviation industry. Turkish Technic CEO Ahmet Karaman declared: “Offering its services to the most important A330 operating airline, Turkish Airlines; Turkish Technic is an important trademark providing MRO services to more than 700 aircraft through 3 continents. We have been delivering high-end services for Onur Air’s A320 fleet since 2012, and we thank our counterparts for their renewed confidence in choosing Turkish Technic component repair and access services for their A330 fleet. Lake Forest, CA | July 26, 2017– Air China, the flag carrier and one of the major airlines of the People’s Republic of China, has selected inflight entertainment and connectivity (IFEC) solutions from Panasonic Avionics Corporation (Panasonic) for its fleet of Airbus A350 aircraft. Under the terms of the agreement, Panasonic will provide its industry-leading eX3 inflight entertainment for 10 Air China A350 aircraft. The first of these aircraft will be delivered in December 2017. By selecting eX3, Air China will offer a unique passenger experience that includes audio and video on demand, a content library that can offer up to 300 movies, 200 TV shows, games, music, a moving map, and much more. These A350 aircraft will also offer global connectivity services, which will allow Air China passengers to keep in touch with friends, families, co-workers and current events everywhere these aircraft fly. Panasonic operates connectivity service in 210 countries, including China. Geneva | April 3, 2017– Airbus and SITA have launched new Security Operations Center Services customized for the specific needs of the air transport industry. This new incident detection services will provide airlines, airports and other air transport industry stakeholders with information about unusual cyber activity that may impact their businesses. By joining forces, SITA and Airbus can provide the most advanced cybersecurity solution for the air transport industry. Almost every airline and airport in the world is a customer of SITA and it delivers solutions for the world’s most extensive communications network. Airbus works with companies, critical national infrastructures, governments and defense organizations to detect, analyze and counter increasingly sophisticated cyberattacks. Together they will use their expertize to detect cyber activity relevant to airlines and airports. When requested, the joint Security Operations Center Services will provide appropriate containment and remedial action ensuring that a company’s digital assets are safe from attack. Plaisir | March 29, 2017– Zodiac Aerospace will present its latest innovations in Cabin, Seats and Systems at Aircraft Interiors Expo in Hamburg from 4-6 April at its main stand 7B40, stand 4C20 in the IFEC zone, and at stand 4E10 at World Travel Catering Expo. At the main stand 7B40 Zodiac Aerospace will present its two finalists for the prestigious Crystal Cabin Awards: the ECOSTM baggage management system and the RevolutionTM toilet. Both products are integrated in a real size ECOSTM Cabin mockup that additionally features updated PaxPOD PSUs, DMS Lavatories, the Space-Flex v2 galley-lav aft complex, and Z300A and Z85 economy class seats with the latest RAVE IFEC products. Other highlights at the main stand are the Zodiac Connected Aircraft Experience and the launch of three new seats: Optima, a unique business class offering the perfect balance of efficiency and comfort; Skylounge, that combines flexibility, customization and comfort, and Z400 which will sets new economy seat standards. Get comfortably seated to view the extensive range of economy, premium economy and business class seats and the many innovations at the stand: Try the new LED lighting offer, look at the benefits of the Cabin Surveillance System or discover how the power of scent from our Five Fragrance diffuser can complete your flight experience and boost on board sales. After your visit to the main stand, be welcomed at stand 4C20 in the IFE hall to take a look at the latest RAVE IFEC offer, and discover how you can get more control over your own flight experience with SeatNet Elite, the new Heliott Reading light and Whizper Noise control. 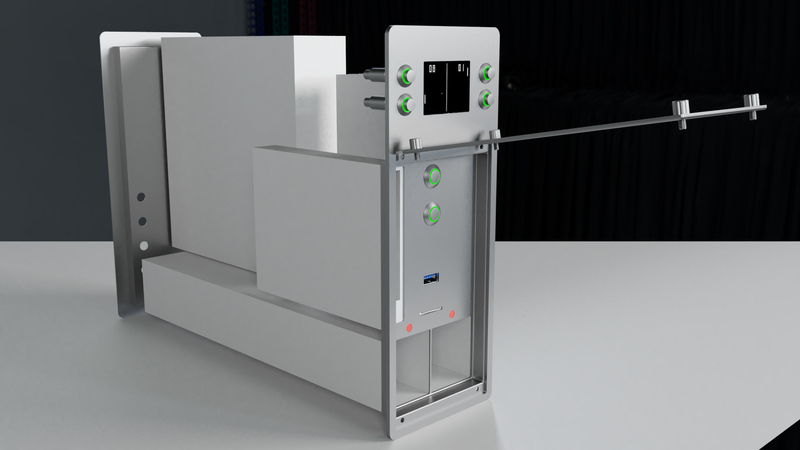 Finally at the World Travel Catering Expo, stand 4E10, Zodiac Aerospace will be proud to show you its latest addition to the Hybrite S trolley and container line: the smart Universal Waste Solution for trolleys. Additionally it will present the Smart Lock and Cool trolley. Come and take a look at the new real size ECOS cabin mock up that includes the Crystal Cabin Award finalist ECOSTM Baggage Management System. With checked luggage charged at a premium, more than 80% of today’s passengers try to bring theirs on board and almost half of those bags are larger than the aircraft was designed to carry. The result is a perfect storm of stress and anxiety at the boarding gate for passengers and crews alike. ECOS is much more than a larger overhead luggage bin. It is a system which addresses cabin design and how both passengers and crews interact with it to make maximum use of limited overhead space. With ECOS, a happy passenger is one who can bring what they want and depart on time. That also means stress free crews and efficient aircraft turn-around operations. Get a behind-the-scenes look at the latest products including the Crystal Cabin Award Finalist – RevolutionTM Toilet. The RevolutionTM toilet is a modular toilet assembly that minimizes health hazards in the lavatory. It not only uses 33% less water per flush than the industry standard toilet, but also uses composite and recyclable materials for a light yet durable toilet. One of the many improvements the RevolutionTM toilet exhibits incorporates air gaps into the toilet rinse ring. This allows the toilet shroud to seal directly to the toilet, creates more airflow for a cleaner flush, and helps prevents waste from building up under the toilet shroud reducing bacteria and odor in the lavatory. Combined with a new 360 degree spay pattern, the RevolutionTM toilet improves the overall health and safety of the passengers and crew in the lavatory. Officially launched at AIX17, Zodiac Seats latest product Optima is expected to set new standards in business class travel. Combining class leading passenger experience and improved cabin efficiency, through a unique cabin configuration that mixes in-line and angled seats, Optima can offer the uncompromised business class solution that the market was expecting. An elevated business class experience comes from direct aisle access for every passenger, large surface areas, extensive stowage options and configurable privacy. Thanks to its seating arrangement and electrically actuated privacy screens, Optima offers an exclusively private environment for travelers wanting to relax and unwind, or passenger interaction for those travelling together. With bed lengths up to 83.5” and the option for a centerline double bed, Optima creates a sleeping experience for travelers that would typically only be associated with First Class Travel. However, Optima’s unique quality is that while it pays close attention to the needs of its passenger, it never forgets the requirements of airlines; to increase their profitability through increased passenger count. The unique cabin layout, originally designed by Acumen, allows airlines to maximize their revenue potential, offering 15% more seats in the cabin compared to standard business class products. Optima can be tailored to the brand of the airline; thanks to its modular architecture. A variety of optional product features and customizable areas, allows each customer to embed its brand identity. This design ethos has been integrated into the product from its origination, building upon Zodiac Aerospace’s heritage and experience in manufacturing bespoke premium aircraft cabin solutions. The perfect marriage of empathetic design and innovative engineering, Optima is the dawn of a new era in Business Class Travel. Skylounge Core is a completely re-designed business class seat that focuses on offering class leading features and airline branding solutions while minimizing program costs. Its revolutionary product architecture enables airlines to offer the best possible experience to their passengers whilst also offering airlines customizable elements that reflect their branding and unique identity. This next generation platform offers a reliable and risk free solution with quality at its core. A business class seat must represent the airline’s brand, but also needs to be easy to maintain. That’s why Zodiac Seats developed a modular architecture based upon the need to customize high value brand-able areas. With a few simple changes customers can make this seat their own. Zodiac Seats has created the PAX module which includes all the features dedicated to the business class passenger. Ideally located above the console it is entirely customizable from a fully open design to maximum stowage capacity option. The aisles’ privacy wings are also customizable to let airlines select between an open cabin feel or maximum privacy. Skylounge Core reduces maintenance cost and improves on time delivery performance. Skylounge Core is a new member of the successful Skylounge family, offering a more flexible and easy to customize new offer. Zodiac Aerospace launches a new long range economy class commercial airline seat at AIX17: Z400. The Z400 series offers increased living space and greater weight optimization while establishing a new standard in comfort for seats in its class. In developping Z400, Zodiac Seats worked closely with ergonomics experts and the latest structural analyses software to create a design that is smooth, contemporary and completely optimized for weight with a beginning weight of 10 kg per PAX. The sleek IFE system integrations have been designed to provide a seamless appearance accommodating up to a 13.3 inch monitor. The thinner design of the seat back, coupled with the articulating motion, provides industry leading shin clearance. The result is an ergonomically satisfying, comfortable, and enjoyable flight that will leave passengers with a fresh experience that positively reflects the airlines’ brand. Cherry on the pie is a revisited meal table design that hides a unique passenger module which is fully customizable. Two different mock ups of the Z400 will be displayed at Zodiac Aerospace stand 7B40. This includes one with the latest IFE screen manufactured by Zodiac Inflight Innovations. The Z400 will be available on A330, A330NEO, A350, A380, 777, 777X and 787. Noise is stressful. Noise is disturbing. Thanks to WhiZper, the passenger can now experience a quieter flying trip. The active noise control system protects the passenger from environmental sounds. The passenger can comfortably watch its favorite programs, listen to its own music or just read or sleep without disturbing or being annoyed by its neighbors. This headset-free technology keeps the passenger in a quiet environment and mood. If you have to adjust your reading light every time you change position, you quickly stop moving… and are uncomfortable! With the smart reading light, the passenger can now focus on what one’s reading, the light automatically adjusts to the passenger. Tracking the passenger’s support, Heliott always lights at the right place, at the right moment. The passenger can freely move around in its seat, comfortably enjoying his reading. Turkey |December 27, 2016– (MENAFN Press) Turkish Airlines has selected Panasonic Avionics Corporation’s (Panasonic) advanced eX1 inflight entertainment and communications (IFEC) system and Global Communication Services for its new fleet of narrow body aircraft. eX1 solution is an advanced narrowbody IFE system. Its uncompromising industrial design, high-definition display technologies and high fidelity audio create a home theater atmosphere that draws passengers into an immersive entertainment experience. The system will include Panasonic’s unique Passenger Data Integration (PDI) service, which will allow Turkish Airlines to add higher levels of personalization to its inflight experience. PDI will also allow Turkish Airlines to seamlessly recognize the travel preferences of their guests and recommend content, services and specific amenities that will enhance their experience both in flight and in their destination city. PDI will leverage a custom-designed Companion App that will enable passengers to securely pair their mobile device to the IFEC system and personalize and enhance their entertainment experience through capabilities that include custom playlists and a second screen environment. The onboard experience will also include high-speed, global Wi-Fi and multiple channels of live television, enabled by Panasonic’s Global Communications Services. It is the only worldwide inflight connectivity service operating in every country in the world today. Turkish Airlines passengers will be able to use the service to remain connected to their friends, families, co-workers though high speed access to the Internet, social media platforms, corporate VPN networks and more. Passengers will also receive Live Text News customized for Turkish Airlines by Anadolu Agency (AA), a leading Turkish News Agency. The television service, which is unique to Turkish Airlines will feature TRT World Turkish News Channel — a new channel from Turkey’s national public broadcaster, TRT, which broadcasts balanced, in-depth reporting with a focus on global responsibility. It will also offer eight additional global channels including Sport 24. Sport 24, which is owne and operated by IMG, offers live coverage of the world’s most popular sporting events. In 2016, the channel showed live action from the Rio 2016 Olympics Games, Premier League, NFL, UEFA Champions League, NBA, Tennis Grand Slams, Bundesliga, Golf Majors, MotoGP and the Ryder Cup. Panasonic Avionics is the only authorized distributor of Sport 24 to the air transport market. Turkish Airlines’ new state-of-the-art inflight entertainment, global high-speed Wi-Fi and live television services will be available on 92 Airbus A321 NEOs-ACF, 65 Boeing 737 MAX 8s and 10 Boeing 737 MAX 9s. As part of the contract, Turkish Airlines has the option to equip the last 45 aircraft with its own direct affiliate’s IFE system, pending line fit offer ability. As part of the strategic partnership agreement, Panasonic will establish a Media Center and creative services team at Istanbul’s new airport until the first operation in this airport takes place, which will service Turkish Airlines exclusively. The facility is designed to fulfill the airline’s content and software needs with racks to support media, interactive development and applications. France | November 26, 2016– Airbus is evaluating a new standard high-bandwidth architecture that will provide faster and more wide-reaching connectivity services on-board its modern, market-leading jetliners. Using the in-house A330 testbed aircraft this autumn, Airbus became the first in the industry to flight demonstrate such a high-bandwidth connectivity platform – which will enable faster internet, mobile telephone services and support applications for passengers and airlines via high-throughput satellites. Applying high-bandwidth connectivity is an important part of the company’s focus on providing a superior on-board experience – and soon will allow airline customers to choose from the range of new high-throughput satellite technologies such as Ka-band and Ku-band for continuous worldwide connectivity. In-flight connectivity is becoming increasingly important for passengers, who now expect to always be connected – using their own electronic devices to access the internet, exchange with those on the ground and enjoy social media. Airlines also are demanding the need for connectivity solutions to enhance their operational communications, such as with digital cabin logbooks, telemedicine or for credit card authentication, as well as to generate ancillary cabin revenues. With the start of testing successfully underway this autumn, Airbus is expected to be the first aircraft manufacturer to offer this standard architecture on its commercial airliners – with service entry for this solution planned for the third quarter of 2017. Airbus’ high-bandwidth connectivity architecture will be available from multiple suppliers for applications on its A320, A330 and A380 jetliners, which supplements the A350 XWB – a “digital native” that entered service with high-bandwidth connectivity capability. Annapolis, MD | November 21, 2016– Aegean Airlines is now experiencing the operational benefits of air-to-ground data link communications using Rockwell Collins’ ARINC GLOBALink℠. The new GLOBALink implementation is enabling the airline to become more efficient by using data link messages to improve departure control and turnaround, send and receive real-time aircraft and engine data to improve maintenance operations and upload gate connection information to aircraft inflight entertainment displays to enhance the passenger experience. Singapore | October 25, 2016– Panasonic Avionics Corporation (Panasonic) and Aeromexico, Mexico’s Global airline, today announced the extension of their long-running partnership. The new agreement will see 60 Boeing 737 MAX with Panasonic’s most advanced linefit IFE system for single-aisle aircraft. eX1 will offer Aeromexico passengers a familiar, easy-to-use, personalised interface that has been designed for an optimal viewing experience. This is backed by the industry’s largest library of games, audio and video. Panasonic’s IFE system also provides airlines with a business platform that drives additional revenue and promotes greater brand loyalty by offering a consistently engaging experience with the highest levels of personalization. Each system can be seamlessly combined with broadband connectivity to deliver high value services such as targeted advertising, concierge services, communications, social networking, streaming live television, phone services, and real-time commerce. Paul Margis, President and Chief Executive Officer of Panasonic Avionics said: “Panasonic has a long and distinguished partnership with Aeromexico, and we’re proud to develop it further with the announcement of these 60 additional aircraft. The enhanced partnership means Aeromexico will now be able to deliver the same entertainment experience of its 787 fleet to its narrow body aircraft”. Panasonic works hand in hand with seat designers and manufacturers to create fully integrated IFE systems that give passengers maximum control of the seat environment. Its systems act as a powerful business and marketing platform for airlines, making it easy for passengers to browse and buy goods and services inflight whilst enjoying carefully curated content that reflects the airline brand. Raunheim, Germany | October 6, 2016– The airline IT specialist Lufthansa Systems is further expanding its Consulting division to meet the growing demand for professional consulting in the airline sector. The reason for this is that competitive pressure is rising on airlines in the international market. In order to stay profitable, they must explore new fields of business and continually optimize their existing processes. The Consulting team supports airlines in all of these areas and provides independent consultation throughout the life cycle of a project. Many current projects in the industry are being driven by digitization. From navigation solutions on the iPad to crew planning forecasts based on data analyses, mobility and big data are important and forward-looking issues for airlines. As industry experts and specialists, the Lufthansa Systems consultants today are already dealing with the issues of tomorrow. What will airline processes look like in the future? What changes are companies facing? How can airlines respond to these changes in time? When it comes to these questions, too, the consultants of Lufthansa Systems are the right people to ask. They help their customers stay one step ahead of the challenges of tomorrow. Los Angeles, CA | August 8, 2016– Global Eagle Entertainment (ENT) (“GEE”), a leading provider of satellite-based connectivity and media to rapidly expanding mobility markets, today announced that it has signed a contract with Avianca Brasil to provide inflight connectivity to the carrier’s full fleet of over 40 aircraft. Avianca Brasil operates in 24 airports with over 200 daily flights in South America. GEE has been the provider of inflight entertainment content services to Avianca Brasil and its partner airline, Avianca, since June 2015. This agreement, which will expand the relationship with the Brazilian airline, demonstrates the ability of GEE’s technology and content solutions to deliver an unparalleled connectivity and entertainment experience to airline passengers. The service will utilize and incorporate certain assets from EMC, the company recently acquired by GEE, including already procured satellite bandwidth in the region and the Speednet technology to improve browsing speeds. More details on the service will be provided as Avianca Brasil nears the official launch of inflight connectivity for its passengers. Singapore | July 26, 2016– Passengers using Indira Gandhi International Airport (IGI) can now check in faster due to the implementation of Rockwell Collins’ new ARINC vMUSE™ mobile passenger processing solution. IGI, India’s busiest airport and the largest in South Asia, is the first airport to implement ARINC vMUSE, which gives airlines the ability to check in travelers wherever and whenever needed. Providing the airport with a cost effective way to accommodate its rapid growth without additional infrastructure. Enabling the airport to help airlines reduce queues during winter months when weather can cause irregular operations due to flight disruptions. Providing a specialized check-in tool that enables airlines to offer an added level of service, like off airport check in or seat upgrades, for elite passengers. Since 2009, IGI has benefitted from the implementation of Rockwell Collins’ ARINC airport solutions. In addition to ARINC vMUSE mobile, the airport has deployed ARINC vMUSE™, ARINC SelfServ™ Kiosks, ARINC VeriPax™ Passenger Reconciliation System and ARINC BagLink™ for baggage messaging to facilitate passenger processing and reduce congestion.